There’s something very attractive about a slim novel which encapsulates the life of an ordinary person, someone whose life might well be judged narrow by those who stride across the world’s stage. Mary Costello’s very fine Academy Street springs to mind – I’m still trying to work out why it failed to appear on the Baileys longlist, let alone be shortlisted. 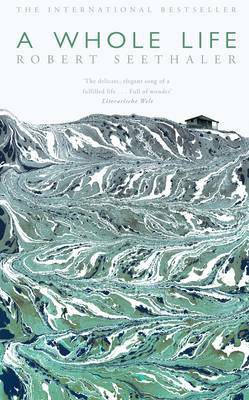 Robert Seethaler’s A Whole Life is in a similar vein: Andreas Egger leaves his Austrian alpine home just once to go to war in Russia where he remained for nine years as a prisoner-of-war. It’s barely one hundred and sixty pages, but Seethaler’s novel reveals a life far richer than you might expect. It opens in 1933 with an almost fairytale-like passage in which Egger tenderly lifts Horned Hans, a dying goat-herd, from his sodden pallet, strapping him to his back and carrying him down from the mountain. When Egger stumbles, Horned Hans unfastens himself and runs off into the snow, leaving the shaken Egger to try to collect himself at the Golden Goat where a lovely young serving woman brushes his shoulder. Egger first arrived in the valley when he was four years old. His uncle was resentful at the sudden appearance of his sister’s illegitimate child, but Egger was strong, more than earning his straw mattress and keep despite the injury inflicted during one overly enthusiastic beating. Aged twenty-nine, Egger used what little he’d saved to buy a small plot and a barn, just enough for him and the lovely Marie when she joined him. Realising it may not be long before they needed a more secure income, Egger found work with Bittermann & Sons, an engineering firm building the cable car runs that had become so popular with the burgeoning tourist trade. All looked set fair until nature intervened. Egger is painted as a simple soul – he’s stolidly practical, feels adrift even a few miles away from his Austrian valley and finds women impossible to fathom – yet he is a great romantic, arranging a message spelled out in fire on the mountainside before finally finding the courage to propose to his beloved Marie. Seethaler’s style is wonderfully clipped and matter of fact, punctuated by the occasional philosophical reflection or lyrical descriptive passage: ‘the distant mountaintops stood out so clearly that it was as if someone had just finished painting them onto the sky’ vividly summons up crystal clear alpine views. The tumult of change which swept through so many Alpine regions in the twentieth century, marking the pristine landscape with gondolas and ski lifts but bringing prosperity, is strikingly captured through Egger’s eyes and experience. A simple life, then, but well lived: ‘He had survived his childhood, a war and an avalanche… …He couldn’t remember where he had come from, and ultimately he didn’t know where he would go. But he could look back without regret on the time in between, his life, with a full-throated laugh and utter amazement.’ Who can say better than that? This entry was posted in Reviews and tagged A Whole Life, Academy Street, Austrian fiction, Charlotte Collins, Mary Costello, Picador Books, Robert Seethaler, Twentieh century on 15 July 2015 by Susan Osborne. Seems like there are two schools of thought here, on encompassing all of life in a single biography: the short ones you mention, and then the solid doorstopper ones like ‘A Little Life’, ‘We Are Not Ourselves’ and ‘Private Life’ by Jane Smiley. I like the premise, but I think I prefer the first variant of it. That’s an interesting point, Marina. I think I tend to agree with you although I admired We Are Not Ourselves very much. You could include Stoner in the first school, too, although Academy Street was the book that came to mind when I wrote the review: ordinary lives revealed as rich and well lived in succinct beautifully expressed prose. You’re right Susan, I DO like the sound of this. And I really like the cover too. I thought you would – one of those slim, pared back, elegant little numbers we both seem to enjoy. I’m with Claire on this one. It sounds right up my street, and your comparison with Academy Street is a definite point in its favour. Thanks for the review, Susan. I hope you like it, Jacqui. A lovely book. It brought back memories of a walking holiday in the Austrian alps for me, casually taking cable cars without really thinking about what installing them had entailed or how they might have changed life for the inhabitants. Love the irony of A Whome Life being the novellla and A Little Life the 700 + page doorstopper. Sounds like a gentle, inviting book one can savour. It’s an object lesson in ‘less is more’, Claire. I much prefer that style but can’t help feeling inexorably drawn to the doorstopper, too. Yes, there are a lot of great reviews out there for the doorstopper, A Little Life I’m kind of relieved that I save my chunksters for a summer read, so I can put it off as a candidate until next summer. There are certainly enough people writing about it to ensure it becomes a much talked about bestseller. And there’s another one coming up from behind – City on Fire, which is even longer – although of the two A Little Life looks more tempting.